kandeej.com: Which 80's rocker should win?!? ooo. I like both of them!! But perhaps the Cyndi Lauper because it looks harder? idk. i love jem!!! OMG THE PINK!!! the blond!!! just looks so gooood! Oh my gosh JEM!! She's truly, truly outrageous! I think Cyndi it looks more fun!! kisses from mexico!.. yeah!! u rock girl!! the colour combo is fantastic! JEM, SHE WAS AN ICON. Everyone looks like Cyndi Lauper now. It's trendy and retro. JEM was a cartoon. How fun is that. Plus I can just imagine the comedic routine you can put together for this. Love you girl!!! You're an ICON yourself. 80's CARTOON rocker JEM !! I did Jem for an 80's party, it was great fun! I'd love to see how you did the Lauper look tho! Dang girl, you've got a LOT of wigs! I love you as Jem. I think you should do that everyday. Hot! i love both looks! the cyndi lauper look pops out w/ color. do the cyndi lauper look please, if not both! i LOVE all your GLAMEOS...always makes me smile. OH KANDEE! PLEASE DO SOME ZOMBIE MAKE UP! PLEASE OH PLEASE! ...or Peg Bundy! Cindy for sure! I love the color, and I want to learn the technique for those eyes! Truly amazing! Jem!! When i was little i loveed this cartoon! <3 kandee you rock!!! My first vote is for JEM!!! LOVE HER! Could you do a misfit look as well? As a kid I always thought the misfit dolls looked so cool! But please put cindi up as well. She is an icon! i love both.. but JEM!!!! 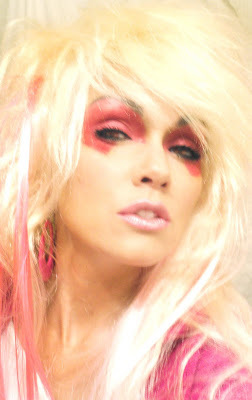 The JEM look reminds me of Debra Harry from the group Blondie (big hit: Heart of Glass). So I'm gonna vote JEM! JEM !! omg i love that cartoon so much. Maybe Misfits also?? jem is truly outrageous! truly truly outrageous! wooaah yeah!! I'd love to see both, but if I had to pick just one it'd be JEM. :) Great idea, Kandee! I would love to see you do both looks but I'd go with JEM if I had only one choice. You rock, Kandee! JEM.JEM.JEM! When you mentioned in a blog that you still had on JEM makeup, my sister & nearly flipped! We <3 JEM!!!! I choose Cyndi! The color combo is awesome! tough call, but I am going with my girl JEM!!! JEM!!! My little sweetie and I have been watching old JEM cartoons on YouTube lol! I LOVE them both. But I'm going to have to go with JEM!!!! It's hard to choose, because they both look awesome, but I think I like Jem better! You know you wanna do both! Oh my gosh...it has to be CYNDI LAUPER! She's just more colorful and pretty here. You've done a great job on both, though--in fact...it would be great if you could do them both! love You so much! you bring the smile into my life, you learn me how to enjoy everyday :) so happy that I have a chance to met you. you are adoreable beutiful person. never change! LOVE YA! Cyndi Lauper looks fun!! I'm sure either will be great :) LOVE you Kandee!!! I would totally love any advice you have on curling hair. My hair doesn't hold curl very well, and I just don't have any techniques for doing it so it takes me like an hour to do. Cyndi Lauper! Oh, and can everyone check out my blog? oh gosh Kandee how can you make us choose? 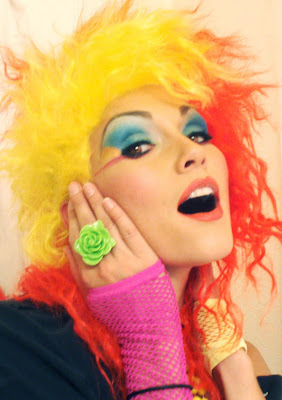 The Cyndi look is so vibrant and colorful awesome!!. But Jem is Glamorous! Ugh it's so hard but Im going with Jem..of course.lol Have a good day! Either way you are an amazing person! But I really love the Jem look!